NEW YORK (January 29, 2010) – The Ailey organization continues to share its mission of bringing dance to the people through the acclaimed Revelations: An Interdisciplinary Approach curriculum for public school students, in conjunction with Alvin Ailey American Dance Theater’s 2010 U.S. Tour. This innovative residency utilizes Alvin Ailey's signature work, Revelations, as the inspirational framework for a comprehensive study of language arts, social studies, and dance. Thanks to the JP Morgan Art of Learning Sponsorship, Revelations Residencies will be implemented in Orange County, CA (February 1-5); Chicago, IL (March 15-19); and New York, NY (March 16-25). Created in 1999, Revelations: An Interdisciplinary Approach engages students’ analytic and creative thinking skills while introducing them to the work and vision of Alvin Ailey. Exploring the life story of Alvin Ailey and Revelations; Mr. Ailey’s beloved 1960 masterpiece, students connect this story to their academic studies, life experiences, community, and the broader world around them. During the residency, Ailey teaching artists will work directly with students and their teachers using customized lesson plans. During Ailey’s 2010 U.S. Tour, students will also have the opportunity to see a live performance of Revelations – which has been seen by and inspired more people worldwide than any other modern dance piece. The Revelations curriculum has been profiled on CNN and has earned enthusiastic responses from previous participants in Atlanta, Detroit, Chicago, Washington, D.C., and London. Revelations: An Interdisciplinary Approach furthers Ailey’s pioneering efforts to use dance to inspire, entertain, and educate people of all ages and backgrounds. 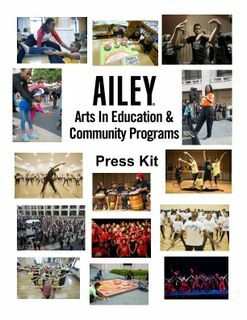 Other activities for your people include master classes, lecture/demonstrations, and AileyCamp, a full scholarship summer camp for underserved youth, now in 10 cities including Atlanta and Miami. JP Morgan is the Art of Learning Sponsor.